The worlds best small engine has got even better! We have not changed a thing but are giving you more for your money. The continued success of the platform has allowed to create this the "BZM VA". Not only will you get the most advanced petrol RC engine! We have added into the box! BZM Micro's Pro 3 stage air filter this filter uses the same tech as used by the Ford WRC team. The filter has been tested in the dustiest places on earth! BZM Micro's V-stack. The best V-stack on the market is included in the kit in BZM red also! Walbro WT257 carb. 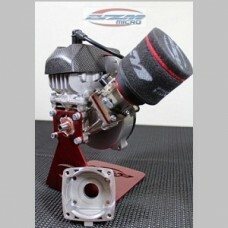 This is the carb best suited to the BZM micro engine. MMR Modified Walbro 771 Carb. How can we make this even better?